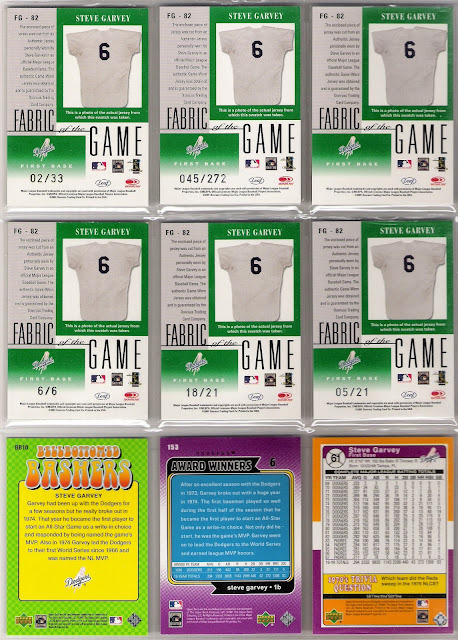 the bronze version of the jersey relics are unnumbered, with the silver/career version being numbered to some significant career number. in garvey's case, that would be 272 - the number of home runs he hit in the major leagues. the gold version is numbered to a season related number, and for the garv, that number is 33 - the number of home runs he hit in 1977 (a career high). it's strange that the front of the card talks about his 115 rbi that year, and not the 33 homers. the century version is numbered to 21 (the 21st century), and i have two of these. one features the red patch from his jersey number on the front of his uniform, and the other features a blue patch from elsewhere within the chest script. i used to have a third century card with a blue patch, but sold it several years ago. the sixth card on the sheet is the 6/6 card and it is gorious. i am a big fan of the red dodger patch. 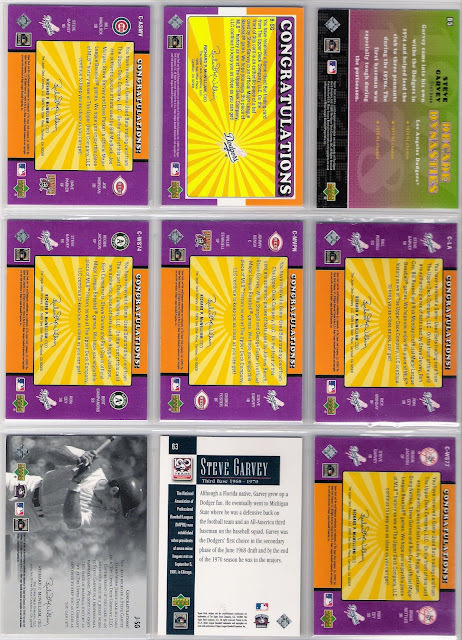 lots of great 1970's players featured on those bat cards - joe morgan, bill madlock, dave parker, johnny bench, george foster, reggie jackson, bert campaneris, willie stargell, and graig nettles, not to mention garvey, ron cey, bill russell, and rick monday. 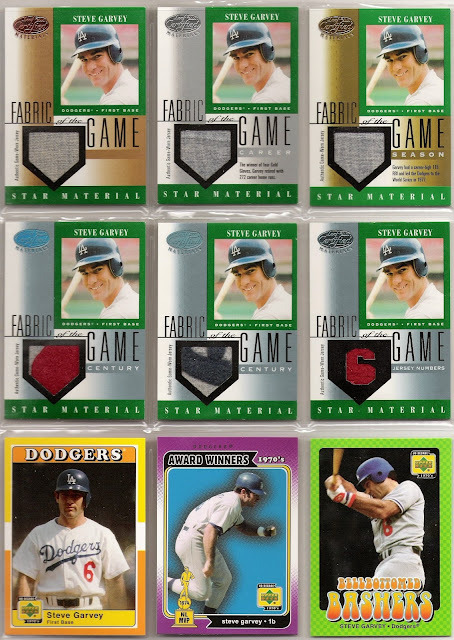 every time i look at that particular card, i am reminded of how close upper deck came to creating a garvey cey russell lopes relic card. 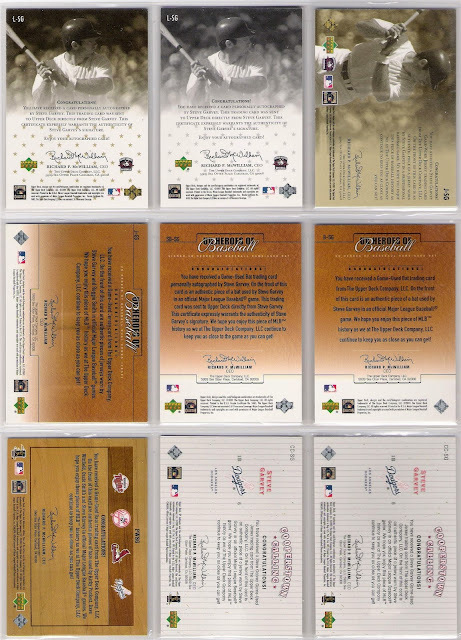 i found it interesting that the gold parallel jersey card was serial numbered to 25 by way of printing, while the gold auto parallel was hand numbered to 25, as was the auto/relic from prospect premieres and the 'base' version of the minor league centennial auto. i believe that the dual jersey card with reggie smith was at one time reported to have an autographed version, but i've never seen one. 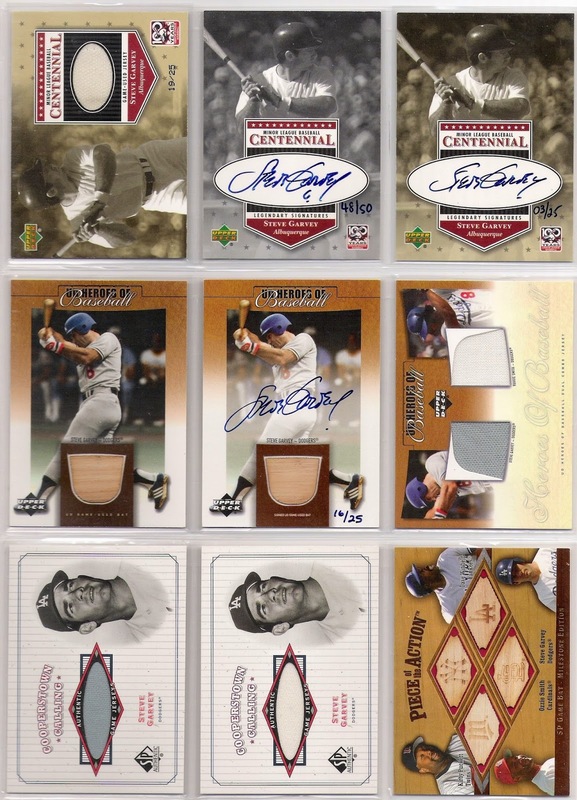 i may not be remembering that correctly, but the design of the card sure looks like it was set up for autographs. 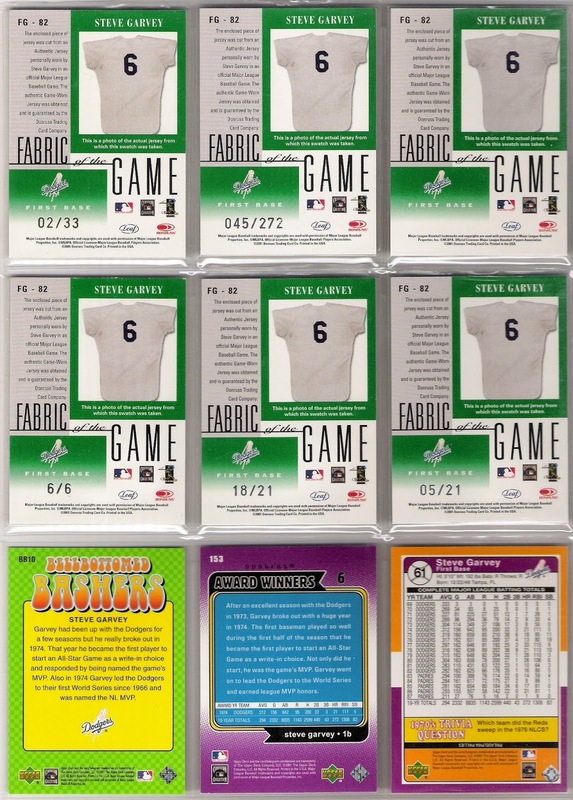 you know that i had to have both white and gray swatch examples of the somewhat depressingly named cooperstown calling jersey cards from sp authentic, and it is again a bit sad that garvey is the only non-hall of famer on that last quad relic with puckett, winfield, and ozzie. featuring lots of assurances from richard p. mcwilliams. next up from the garvey binders, a whole lot of tony perez. stay tuned. 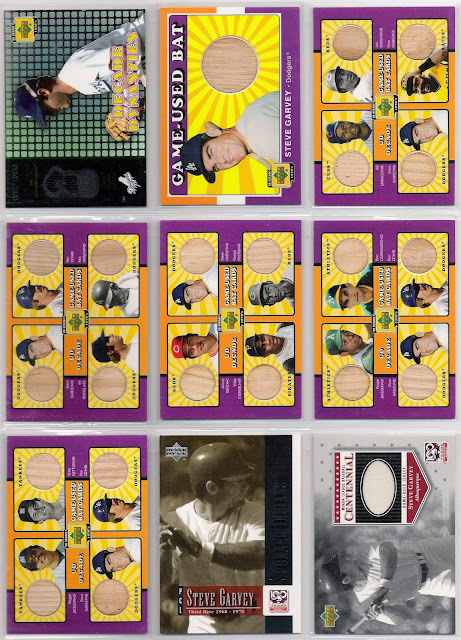 That is a great group of cards. Those early Leaf relics had some funky numbering. Holy cow! What a fantastic set of pages! Damn... your Garvey collection is insane! My favorite page is the UD Decade page. One of my favorite products from the 2000's.